Grunt Labor has lots of great project ideas. Some of those ideas are born out of sheer creativity and genius. Some of those ideas are born out of being annoyed by his wife’s ongoing accumulation of junk prized possessions. 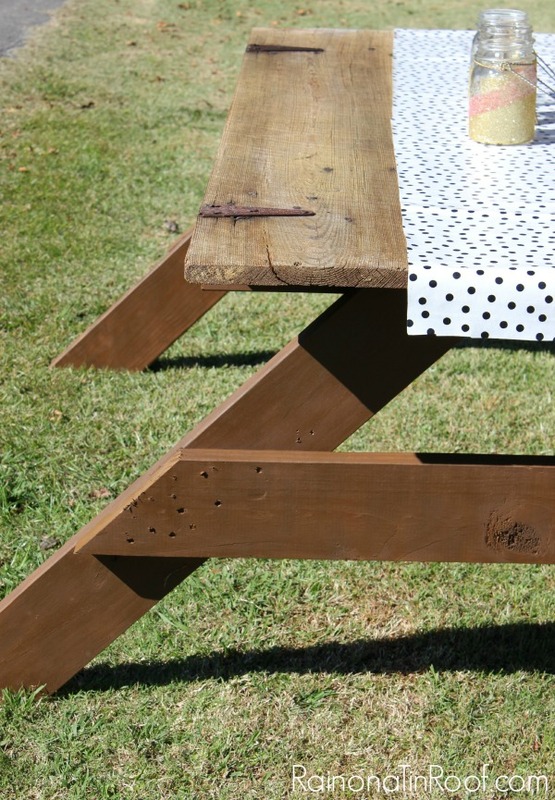 This DIY picnic table made out of an old barn door was a combination of both Grunt Labor’s genius and annoyance. After we got past a couple of hiccups with this project, the table is actually pretty easy to build. Of course, you can learn from our mistakes and it’ll be a breeze for you. Also, if you don’t have a barn door lying around, you could make the base first and then add on some weathered pieces of wood or just 1x8s or 1x10s if you wanted to. 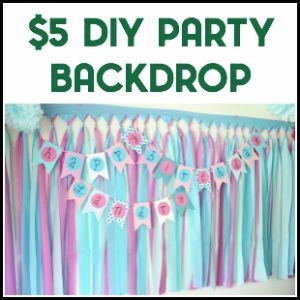 This barn door has made an appearance once more on this blog – when I used it as a backdrop for the kid’s 1st birthday party photo collage. Guess where its sat since then? 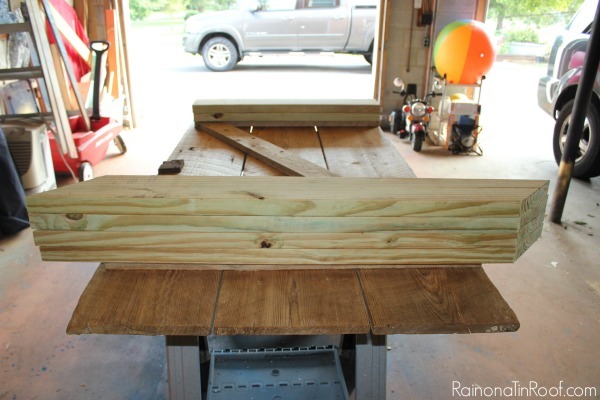 I wet both sides down with the water hose first, let it dry a little, then laid it down over two sawhorses. Next, I mixed up the Oxy Foaming Cleaner and sprayed it on one side of the door with a pump sprayer. I let the cleaner sit on the door for about five minutes or so, then scrubbed it with a brush to really remove all that dirt. You could literally see the dirt coming off this thing. This is the same cleaner I used to get my sidewalk sparkling clean – and you remember how gross it was. After I scrubbed it good, I sprayed off the cleaner, then flipped the door and repeated it on the next side. After you have cleaned both sides, prop the door upright and let it fully dry. Two pieces should be cut down to 34 3/8″ long or the size of the top and bottom of your “Z” on the bottom of your barn door. No angles on either side of the wood, just straight cuts like the photo below shows. 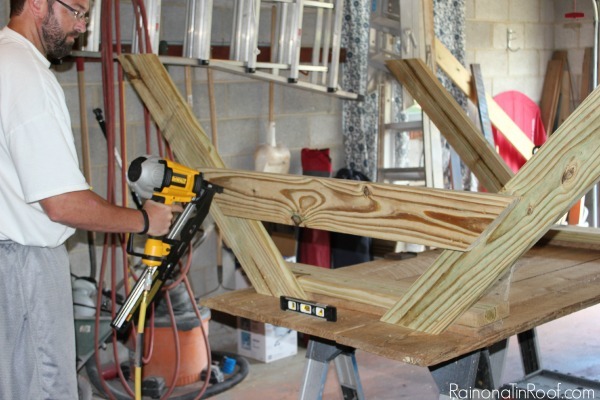 Four pieces should be cut down to 48″ long, then miter them with a 45 degree angle on each end. However, you want your “long ends” on opposite sides, meaning the pieces should look the state of Tennessee when you have them cut correctly like the photo below. 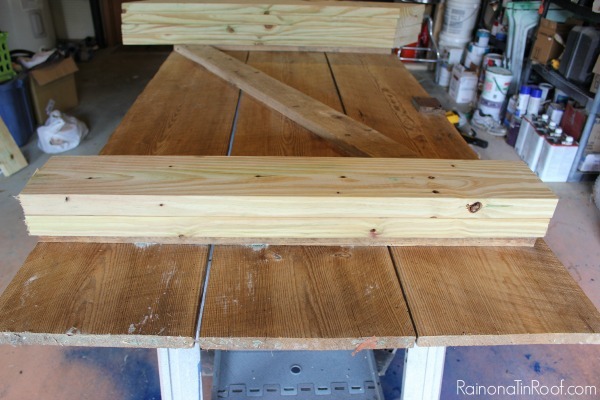 Two more pieces should be cut down to 48″ long each then each should be angled at the ends with 45 degree angles to make them look like a trapezoid. Nail on your base pieces. Make sure your barn door is laying with the “Z” right side up. 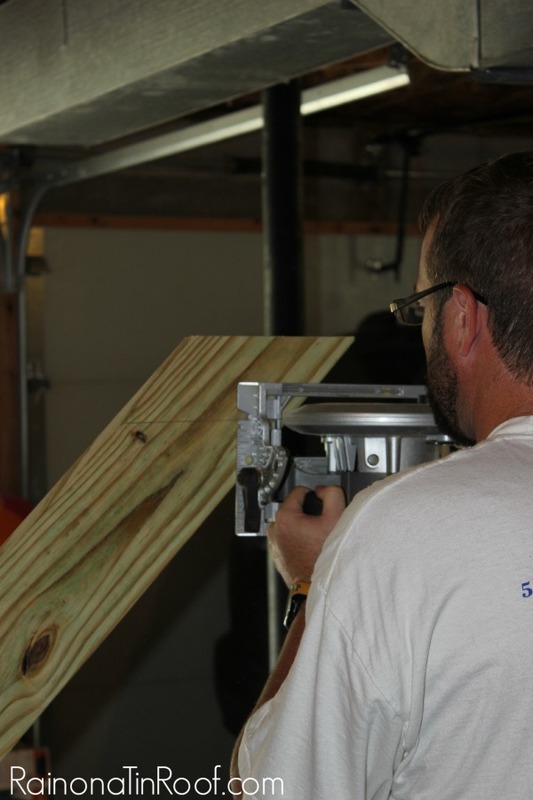 Apply glue to the ends of your “Z” on the door and then nail or screw down (we used our framing nailer for this project, just because it made it faster. You can totally use a drill though.) the straight 34 3/8″ long wood pieces. Take the four pieces of wood that you cut to look like the state of Tennessee (don’t you love how technical I am?) and attach two on each side of your barn door. Simply nail / screw through the leg into the straight piece of wood that you just attached to the door as seen below. This is where we ran into a bit of a snag. See how far out that leg is. That is what you are not supposed to do. When we turned our table right side up, we realized that and had to fix it. 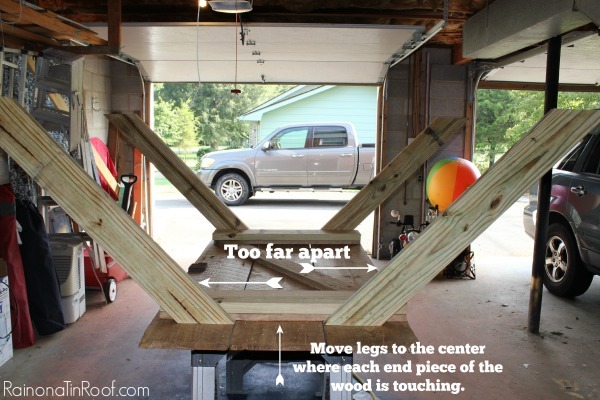 Move your legs right into the center of the door, with the tips of both pieces of wood touching as shown below. You will still attach them to the straight piece of wood that you first nailed to the door. You should have two long pieces of 2×6 left, the ones you cut to look like a trapezoid. Take those and nail them across your legs, making sure they are level before you nail them in. You probably don’t really have to do this step, but hey why not? 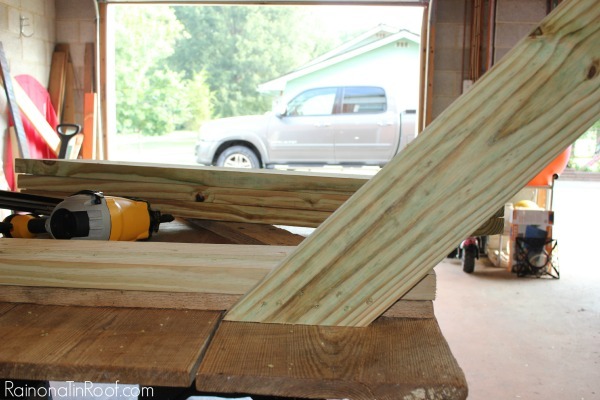 You should have some scrap pieces of wood triangles lying around from where you cut the 2×6’s. 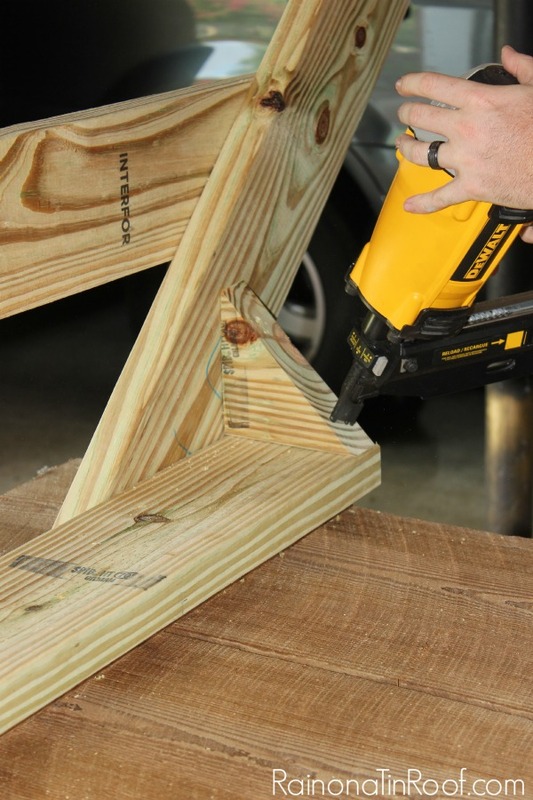 Take a few of those and place them behind your legs at the top, where they meet the first piece of wood you secured to the door and nail them in as shown in the photo below. It takes five minutes to do and doesn’t cost anything extra. 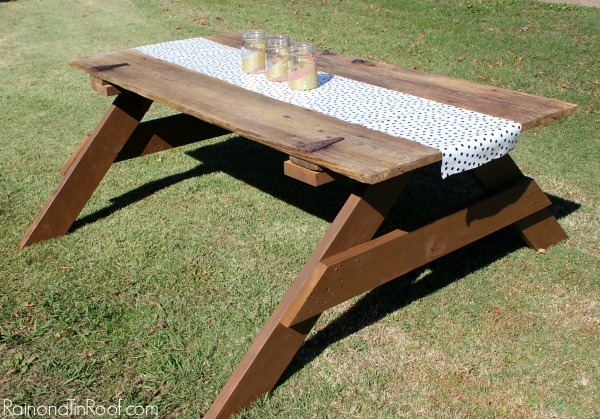 At this point, stand your picnic table up and see whether or not you like the height of your table legs. Test out the table with a chair. We wanted to shorten ours a bit, so Grunt Labor used a circular saw to trim them down some. I wanted to keep the barn door’s color as it was, but it didn’t look great against the pressure treated legs. 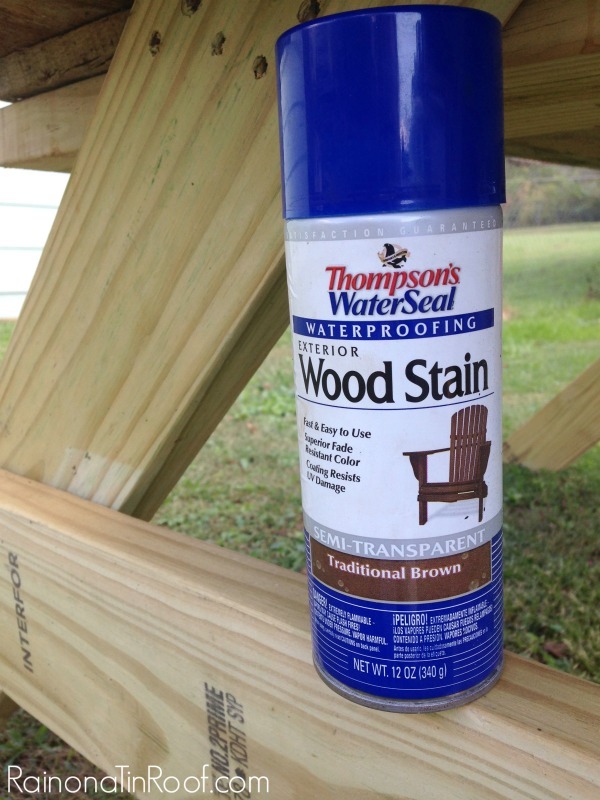 I used Thompson’s WaterSeal wood spray stain in traditional brown to give the legs a quick and easy stain job. You literally just spray it directly on the wood and let it dry. I did about three light coats to get even coverage. 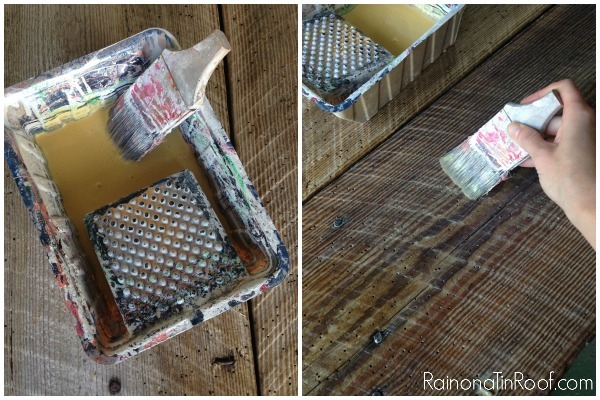 This is the same stuff I have used to makeover my mailbox in under an hour and to refresh my lattice easily. Like I said, I wanted to keep the barn door the natural color that it had aged to, but I wanted to make sure it was protected. Did I mention this barn door came from my great-grandfather’s barn? And you guys know how attached I get to family heirlooms. Yes, a barn door is absolutely a family heirloom. 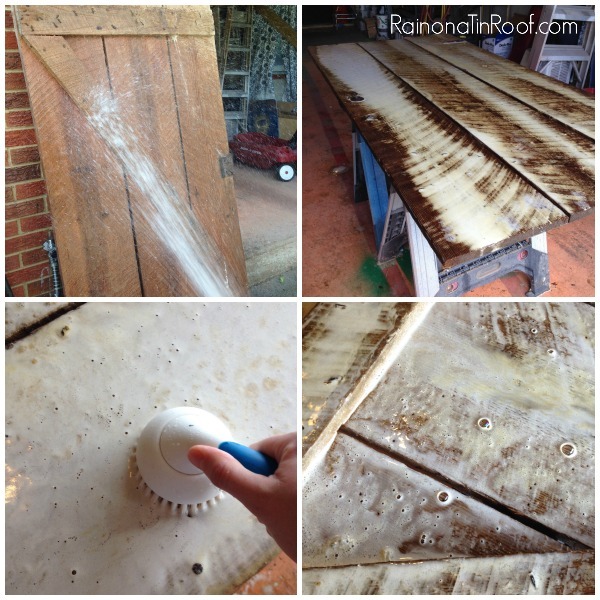 To keep the barn door’s history intact, but protect it, I used Thompson’s WaterSeal Advanced Clear Waterproofer. 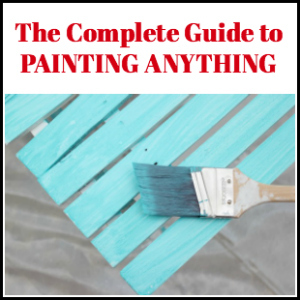 It takes one single coat and you can use the piece you are protecting the next day. Fast and easy – my kind of product. I just poured some out in a small paint container and brushed it on. I did one coat on the edges, top and bottom of the door, then let it dry for a day. The waterproofer did darken the wood a bit, but it definitely still has that old, rustic look to it. So, I’m going to be honest. When Grunt Labor came up with this idea, I wasn’t too gung-ho on it. I was just more doing it because he wanted to. I freakin’ love this table. I can’t wait to have some cozy little dinners around this thing. 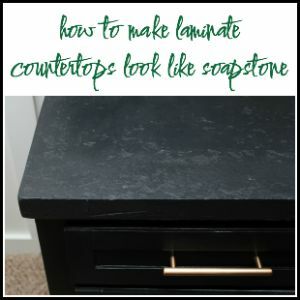 Disclosure: This post is a collaboration with Thompson’s WaterSeal. However, all opinions and accumulation of junk is 100% mine. Love this project! The barn door gives your table so much character! Pinning! Thanks, April! Yes, I love how much the door adds to the table! 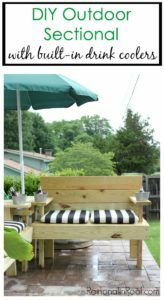 We have an old picnic table that needs some repair over the winter for next year plus the fwo chairs on front porch need a littl refresh. Like your table. Thanks, Charles! This would be perfect for your table! I would love to make a large outdoor table! I’d use it on our deck! We too have a picnic table and this would be wonderful to use on that! Thanks, Jamie! That cleaner is amaze balls! Yes, he was Chris!!! Thanks! Are you cooking it all? If so, then ok! Thanks, Rachel!! 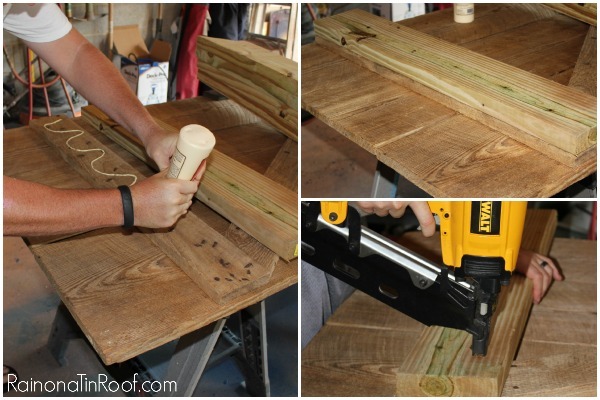 Your barn door table – or whatever you use it for – will ROCK! You had me at “barn door”! Love it. haha! I know, right!? Thank you! I would use it on an old bench I have that lives outdoors. 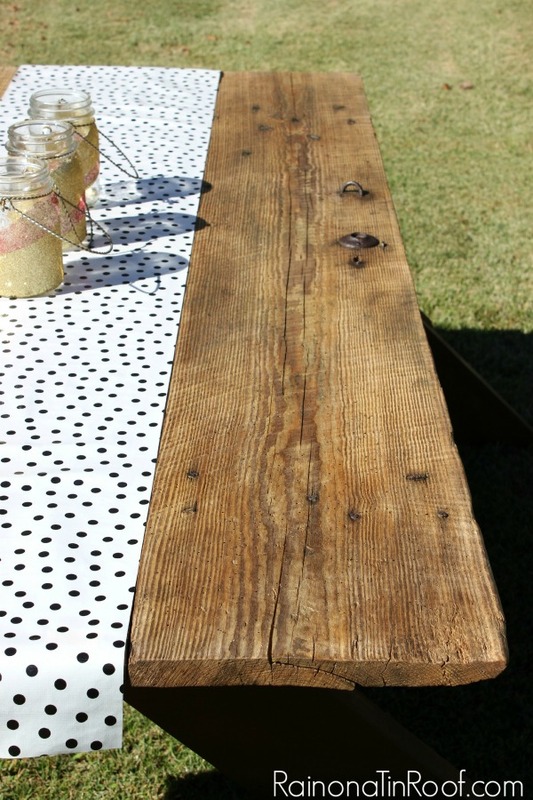 I have been wanting to build a farmhouse table for our backyard, but I also love the barn door table! This would be definitely something to use the sealer on to stand up to the weather! I would use it on my new terra cotta pots. Thanks. Love this table! It looks so amazing! This is awesome, Jenna! The finished table is beautiful!! ohhhhh, Jenna! Good thing for Grunt Labor – this is awesome!! Thanks, Chelsea! Yes, he was a total rockstar on this one! Love it Jenna, what a great reuse of something that would otherwise be thrown out. 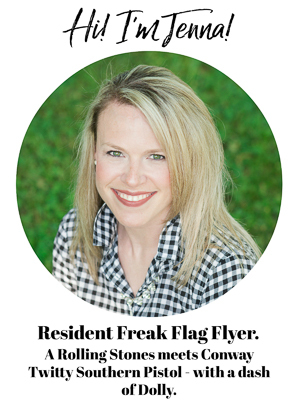 Thanks, Amanda!! I am just loving its rustic goodness too!! Love this! I want to make one!! 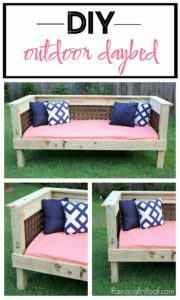 I would love to build an outdoor bench. The stain would work perfectly on it! I love this. GL did good! Yes, he did! Thanks, Liz! The barn door adds so much character Jenna -love how it turned out! Thanks, Krista! I love all that character goodness too! I love this! Such a fun and creative idea! 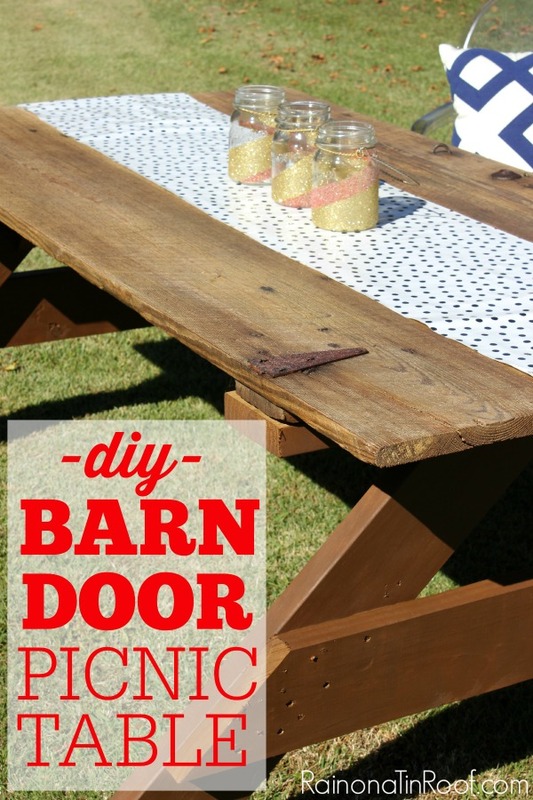 The barn door gives the picnic table a great touch of flair! I’m pinning this project now! 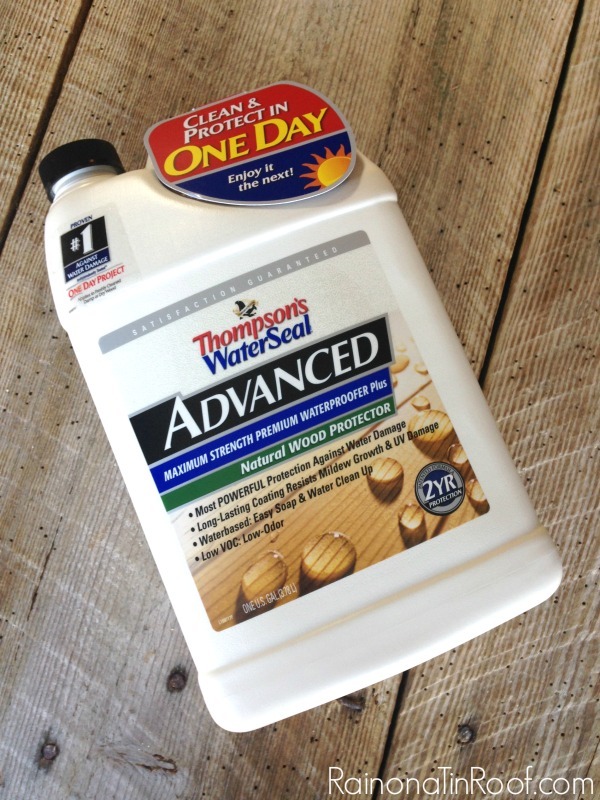 I would use the Thompson Water Sealer on my back porch. 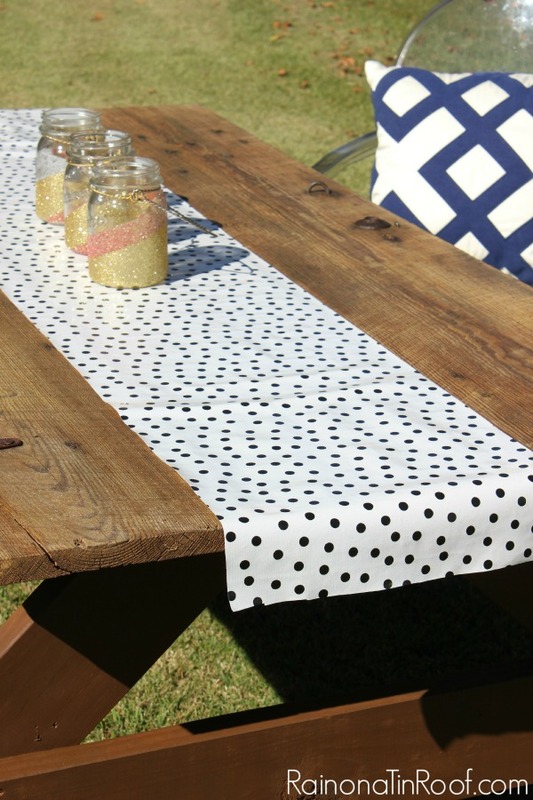 Love the barn door picnic table. Great job! I would use it on some wooden chairs we have outside. I would use it on our back deck. It could definitely use a new coating!